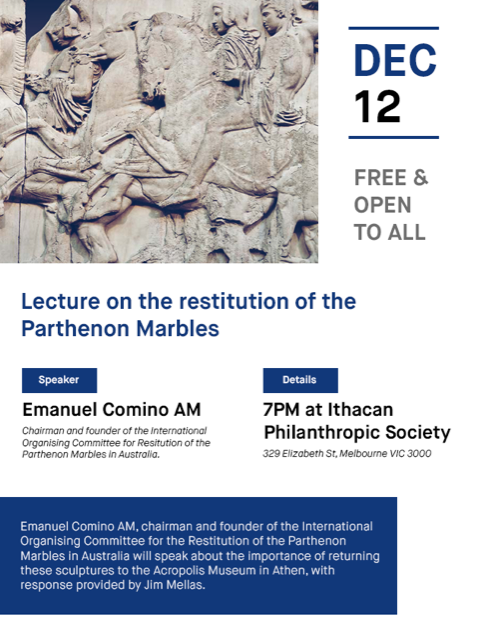 Emanuel Comino AM, Chairman and founder of the International Organising Committee for the Restitution of the Parthenon Marbles in Australia will speak about the importance of returning these sculptures to the Acropolis Museum in Athens. Mr Jim Mellas will provide a response. It will be held from 7pm on 12 December, at the Ithacan Philanthropic Society at 329 Elizabeth Street, Melbourne.